Thai Green Curry is another successful recipe from Simply Nigella, a book which includes this recipe. Since the book came out, it’s placed itself comfortably into a spot in my regular rotation. Although, this recipe cannot pretend to be totally authentic (I don’t think turkey is much used in Thai cuisine), I love how flavoursome this curry is and the turkey meatballs just melt in your mouth. I love the spiciness and the coconut flavour in the curry, plus the smell of it is intoxicating. 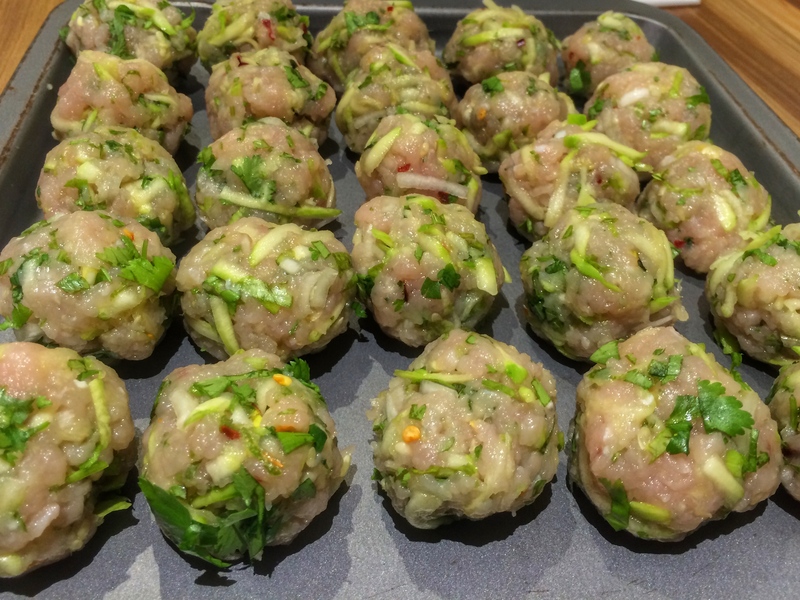 To prepare the turkey meatballs, peel one of the courgettes and coarsely grate. 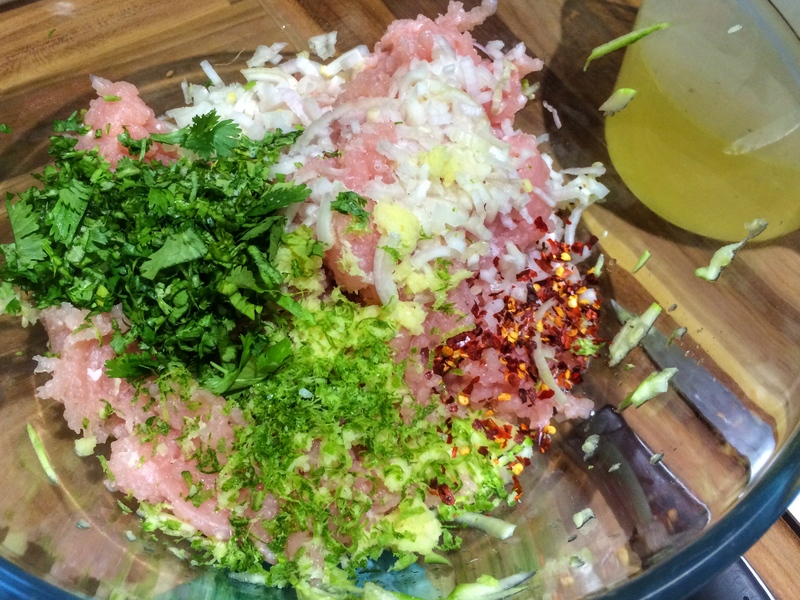 Squeeze out as much excess liquid as possible then put in a large bowl with the turkey mince, the whites of the spring onion (reserve the green parts for later), grated ginger, garlic, chilli flakes and zest of the lime. Add seasoning and mix together by hand until combined. Roll into equally sized meatballs, using a teaspoon of mixture as guidance and set aside. Next, add the remaining green parts of the spring onion to a large pan with a couple of glugs of a flavourless oil and fry briefly. Add the Thai green curry paste, the cream from the top of the coconut milk and whisk together in the pan, before adding the rest of the coconut milk, fish sauce and chicken stock. Whilst you’re letting the mixture come to a gentle boil, peel the remaining courgettes, quarter each lengthways and then chop into 1cm pieces. Add the courgette pieces of the bubbling broth and then carefully place the turkey meatballs in the pan as well, being careful not to break them up. Once the pan has just started bubbling again, turn down the heat and simmer for 20 minutes with the lid on. Check the meatballs are cooked through, then add the juice from the zested lime and sugar snaps. Check the flavour and add seasoning, adjust as you wish. Cook for a couple more minutes then take off the heat. Serve with a bit more chopped coriander/Thai basil leaves and lime wedges for extra spritzing.